lt;stronggt;RCP264043BLAlt;/stronggt;lt;BR/gt;RCP264043BLAlt;BR/gt;Precision engineered for quiet operation. 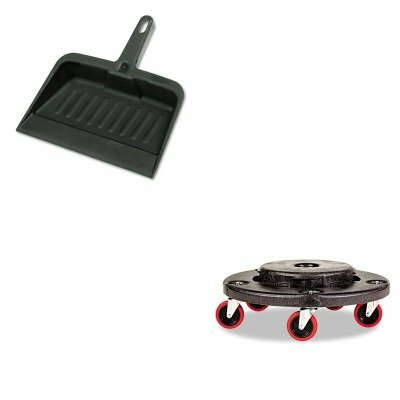 Non-marking red casters to easily identify traditional dollies from quiet dollies. Eliminates 88% of traditional dolly noise across both smooth and uneven surfaces. Twist lock feature secures containers to the dolly. Colors: Black Dolly Size: 18 1/4amp;quot; dia x 6 5/8amp;quot; Capacity Weight: 250 lbs.lt;BR/gt;lt;BR/gt;lt;stronggt;RCP2005CHAlt;/stronggt;lt;BR/gt;RCP264043BLAlt;BR/gt;Handy dustpan features a tapered front edge to help simplify sweeping-up. Heavy-duty, moderately flexible plastic provides commercial-grade durability. Lanyard handle-hole allows you to hang and store the pan out of the way. Material(s): Polypropylene; Width: 8 1/4quot;. ~ Includes one dustpan.